Looking for a way to give your writing impact? Do you need to find evidence to support your viewpoint? Do you want to strengthen an argument? Google Docs has a Research tool that searches for quotes. It will display famous sayings made by presidents, celebrities, historical figures, or sports heroes. When a quote is inserted, a footnote is automatically created. Unfortunately, this tool has limited search results at this time. However, when it works, it is an excellent time saver. NOTE: These instructions are outdated. The Research tool has been removed. It has been replaced with the Explore tool. 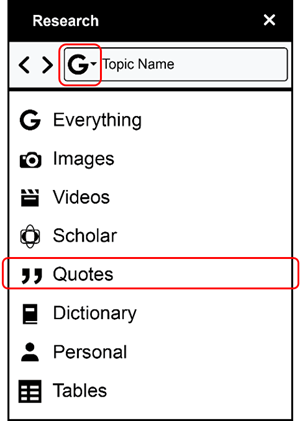 At this time (03/02/2018), the Explore tool does not insert quotes with footnotes. Open your piece of writing in Google Docs. Place the cursor in the document where you would like to insert a quote. From the Tools menu, click Research. Type a person or topic name into the search box. Click the arrow and select Quotes. IF you are lucky, you will get search results. Click Insert to add a quote into your document and automatically make a footnote. Looking for a way to inspire students to write? TechnoNewsletter is a new technology project by TechnoKids Inc. in which students write to a target audience about a curriculum topic. Alternatively they can write about an issue or figure of personal significance. Using the Research tool, students can search for and use quotes to make their writing credible and relevant.